Commonly called the ‘Bat Plant’, Tacca integrifolia is a real show stopper, amazing flowers are the main attraction. 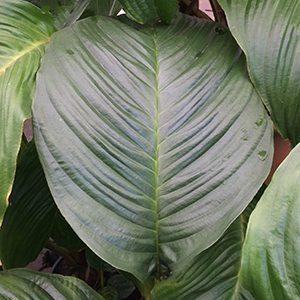 Although the Bat Plant really shines when it bursts into bloom, the large ribbed foliage is attractive through the rest of the year. If you live in a warm climate, or have an enclosed patio, and you are looking a talking point . 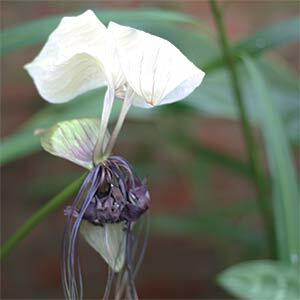 then Tacca integrifolia commonly called the White Bat Flower could be worth a try. A few varieties are around including Tacca integrifolia nivea, also known as the ‘Cat’s Wiskers’ plant. And you can grow them them from seed, generally available on ebay. These are a large plant once they mature, reaching around 1m. The flower spike reaches this height held well above the foliage. They do look best when in flower, however the large pleated foliage is also attractive. The variety T.integrifolia nivia has paler foliage than the species, we think more attractive. The flowers are a clear white. Tacca chantrieri or ‘Black Bat Plant’ is smaller growing and a little more difficult. A native of Malaysia Tacca Integrifolia likes a well drained warm protected position in light shade. With fantastic foliage and flower this one is a unique plant. Being shade loving plant and will grow best in filtered light, a 70% shade cloth is suitable. A good all purpose potting mix is suitable as a growing medium. Always use pure rainwater on these wonderful plants. Tap water with chlorine is not suitable in the long run. Water well and regularly during the growing season, during winter, cut back on watering and allow the soil to dry just a little. Mist spraying during the warmer months to raise humidity is beneficial. Fertilize using a slow release fertilizer. Keep in a frost free position at all times. The best time to repot is in late spring, this gives the plant plenty of time to reestablish its root system before the cooler months. This is a great time to remove any offsets and pot them up as well. The seeds of T. integrifolia are fairly hard and are best soaked in warm water for 24 hours before planting out into individual pots. You will need a propagator that can provide consistent bottom heat to maximise germination. Seeds can take 2 – 3 months to germinate. Propagation by division of rhizomes is generally easier than growing from seed. Usually due to conditions being to cold. Usually a fungal disease, ensure good air flow, you can use a commercial Black Spot fungicide. Brown Often caused by a lack of humidity. This can be caused by inconsistent watering, letting the growing medium dry to much and then overwatering. Always water with room temperature water.